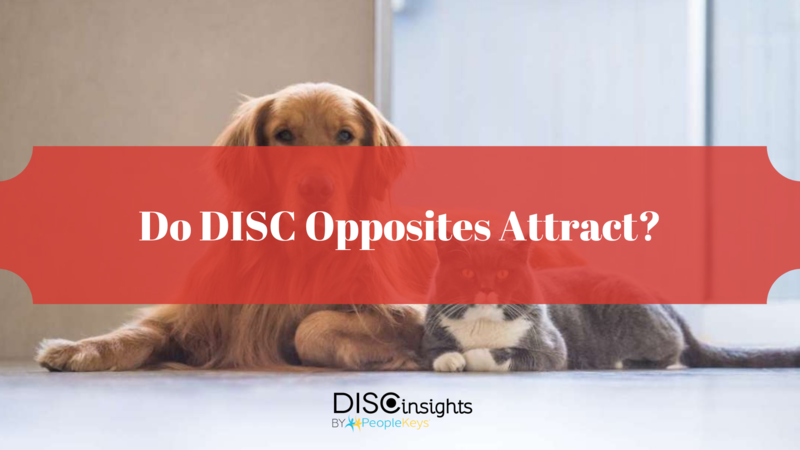 DISC for Valentine’s Day: When it Comes to Personality, Do Opposites Attract? My partner is, in many ways, the opposite of me. This doesn’t mean that we don’t love and understand each other—Just that we approach things very differently. In a relationship, I’m very much an “S” personality style. A peaceful, harmonious household is very important to me. I want to make sure that everyone is happy, even if it means sacrificing some of my own needs to make sure that happens. My husband is a “D.” He’s very independent and hates being told what to do. I’m laid-back; he’s always on the move. I’m happy spending the night puttering around at home. If he’s not doing something all the time, he’s miserable. This might seem like we’re at cross-purposes, but that’s not the case at all. We’re opposite in many ways but complimentary, too. He motivates me. I keep him centered. I keep things running at the house so that he has the time to focus on projects. He makes decisions quickly, with no waffling. He helps me be more assertive. I remind him not to be so self-focused and to think of others. He teaches me to say what I mean and be direct. Learning through each other’s example has helped us both grow immeasurably. It’s been theorized that we subconsciously seek out romantic partners that possess the positive qualities that we lack but admire. In other words, opposites attract. We’re drawn to people that see the world differently, will challenge and inspire us, and will help broaden our perspective. We might not consciously be looking for the Yin to our Yang, but it works out that way more often than not. Of course, if you find yourself in a relationship with a personality style that’s different from your own, there are challenges too. For example, let’s take a look at the DISC graphic above. The styles that appear at opposite corners of the chart are the ones that are considered most different from one another: the D/S and C/I. So what’s the dynamic like for couples that find themselves on opposite ends of the personality spectrum? S's are supportive, loyal, and caring, but they sometimes need to be more assertive and stand up for themselves. A D partner can help with that. When partnered with a D, an S learns that it’s okay to ask for what you need. A D teaches the S to be direct, encourages them to shake up their routine, and gives them the tools to become more self-confident. Of course the D can benefit greatly from being paired with an S as well. An S knows how to soften the rough edges of the D and encourages them to be more thoughtful and diplomatic. A D is a better friend and partner with an S by their side because the S reminds them to think outside of themselves and consider the needs of others. The biggest danger of the D/S pairing is that the S must be careful not to fade away and let themselves be steamrollered by the strong-willed D. The D likes to be in charge, and an S is usually fine with letting someone else take the reins. But just because they’re willing to let someone else lead doesn’t mean that the S will tolerate being bullied. The D has to be constantly mindful not to overstep and be too aggressive or bossy with the S. The S can be easily offended and might not say anything until they reach their (and the relationship’s) breaking point. With too much ordering around, it’s a sure bet that the S will start planning their exit strategy. On the flip side, the S has to remember that the D enjoys a sparring partner. They enjoy an exchange of opinions and crave the stimulation of a partner that engages them intellectually. The bottom line is that if the S is too passive, the D will get bored. This is something that the S needs to remember. Often the S will think they are being nice by letting the D have their way, while the D just sees that behavior as frustratingly meek. People with an I-style personality are funny, energetic, and full of enthusiasm. They love being around other people and are totally in their element at parties and social gatherings. They are creative and inspirational and know how to make just about anything fun. Even a routine trip to the grocery store is entertaining with an I. The down side of being with an I is that they are so outgoing and in-the-moment that they have a hard time with planning and paying attention to details. This is why, in many ways, a C is a perfect partner for an I. The C in the relationship is strategic and organized. They think a great deal about what they’re going to say and do before they act. The C helps the I think ahead, to plan for the future, to be on time, and not to overlook important details. When an I is partnered with a C, their lives are more stable and ordered. An I-style partner is good for a C as well. When a C is partnered with an I, the C has more fun. The I adds a refreshing degree of spontaneity to the C’s everyday life. To a C, the I is motivating, inspiring, and creative—They challenge their C partner to stop thinking and start doing. A C can flourish creatively when partnered with an I because they become more outgoing, more expressive, and less concerned with being perfect all the time. The biggest potential problem between C and I partners is the difference in their levels of social energy. An I can exhaust a C. When a low-key C is partnered with a spirited I, the C can become drained by expending their limited reserves of physical, emotional, and social energy. An I needs to give their C partner the space to be alone and recharge. This might mean not dragging their C partner to every social event they are invited to—Every once in awhile, the C will want to stay home with a good book. Let them. The C needs to be mindful of their I-style partner’s needs, too. C personalities are long-range planners. I-style personalities are not. When your partner is an I, you need to embrace the fact that most of the long-range planning will fall to you. And even when those plans are made, they’re going to need reminding. Be patient. Also, remember that your I-style partner gets their energy from being out and about. They like crowds and being around other people. If you’re not feeling up to a party, it’s okay to opt out. But encourage your partner to go without you—They need to be social and can end up miserable without that outlet. Looking for more ideas on how DISC can be used to better understand your partner and your relationship?